Earlier this week, Verizon’s official Twitter support account made mention of a new Galaxy Nexus update on the horizon. In fact, they said it would be here “soon,” prompting a little excitement from the G-Nex crew. What we weren’t sure about was whether or not this would be a 4.1.2 update or a big jump to 4.2.2, the current version of Android that almost all other Nexus devices are running. Thanks to a very special man with a very special version of the Galaxy Nexus, it looks like 4.2.2 might indeed be the build we see in the near future. If you have followed along in the journey of the VZW G-Nex, then there is a better than average chance that you have grabbed an early test build for the device from El Madhatter, a long standing member of XDA. Well, we reached out to him this morning to check in on his device, and sure enough, he claims to have received 4.2.2 (JDQ39) this week. He also sent along the screenshot above. Unfortunately for our greedy update-needing purposes, he has already applied the update, is no longer rooted, and doesn’t have access to a computer. So any chance of us retrieving this update, are slim for the moment. In good news, we are seeing new radios listed as FK01 and FK02. The kernel appears to be somewhat old, but that could be for a variety of reasons. If you want to follow along to see if someone in the community can get the file or URL of the file from his device, he has created a new XDA thread here. 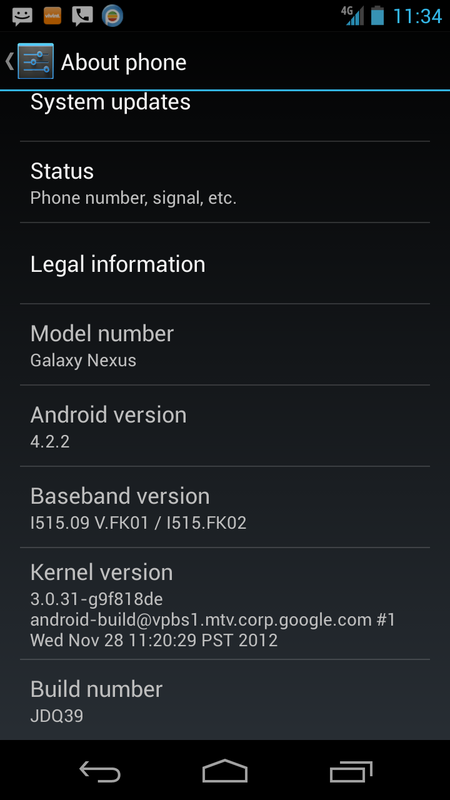 We should also point out that another source of ours is also claiming that the next VZW G-Nex update will be 4.2.2. 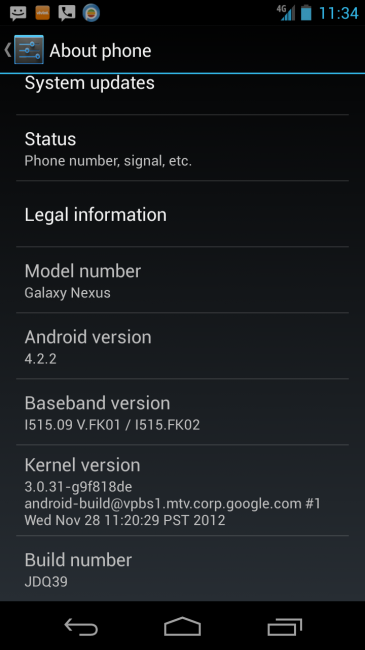 Update: Another XDA thread to keep an eye on. Looks like he was talking to another guy about the update and he’s been active there. Cheers El Madhatter and Open1Your1Eyes0!